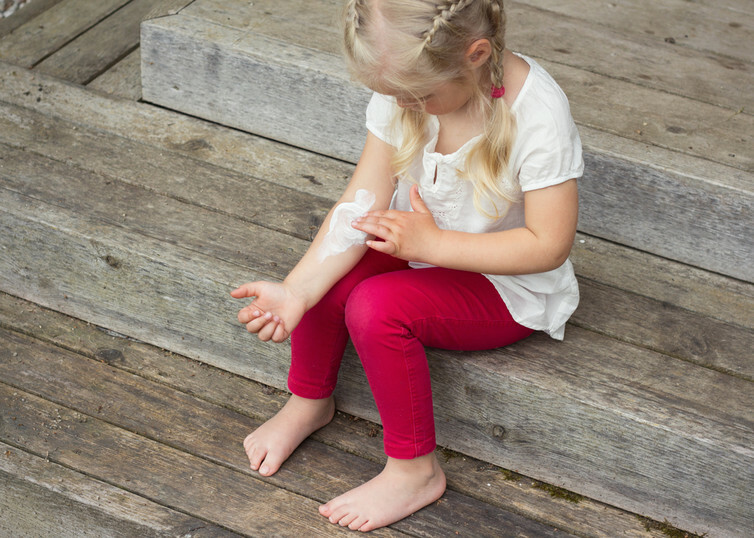 Eczema is a genetic disorder with an environmental trigger, which affects one in three people at some time in their life. 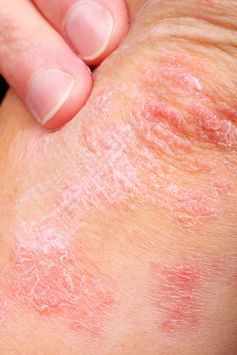 People with eczema essentially have sensitive skin that is easily irritated. The irritation produces dryness by disrupting the function of the external waterproof skin barrier, allowing water to leave the skin. 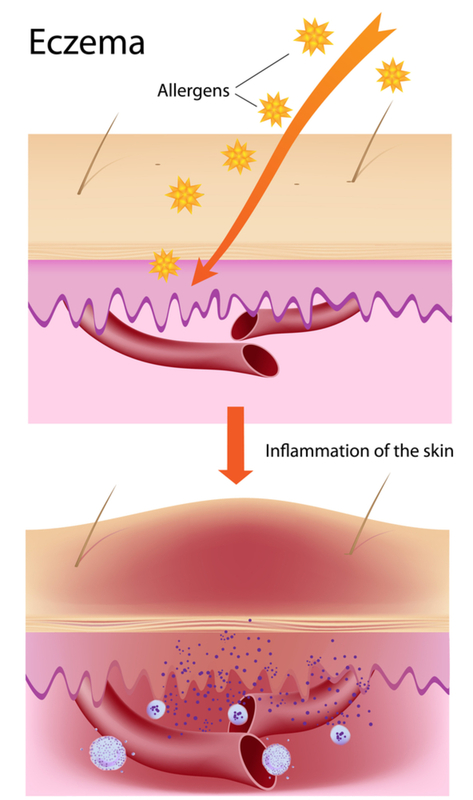 The main gene associated with eczema – or atopic dermatitis, as it’s known clinically – is filaggrin. Filaggrin mutations reduce the ability of the skin to withstand environmental insults and to repair itself after injury. Disruption to the skin barrier allows allergens to enter the deeper layers of the skin and activate the immune system. How the immune system reacts to these allergens determines the severity of the skin inflammation and the duration of the disruption to the skin barrier function. 1) Avoid things that irritate the skin. No matter how wonderful a hot shower feels on itchy skin, it actually aggravates eczema. Keep showers to five minutes or less and use luke-warm water. Wash with water alone: no soap, no soap substitute, no soap-free wash and definitely no bubble bath. Just water. 2) Avoid overheating. Heat makes the itch worse, irrespective of the cause. Turn the heating down to 18 to 20 degrees Celsius (64 to 68 degrees Farenheit) and put on an extra layer of clothing. Take the doona off your bed and sleep under good old-fashioned cotton blankets. Overheating at night leads to scratching in your sleep. If there is blood on your sheets in the morning, that is a sure sign your bed is too hot at night. Apply moisturiser frequently and liberally. Kaspars Grinvalds/Shutterstock. If the eczema is weeping, oozing or has honey-coloured crusts, there is almost always golden staph on the skin surface aggravating the eczema. Bleach baths are a good alternative to antibiotics. 4) Use lots and lots of moisturiser. To fix eczema you will also need to restore the skin barrier. That requires frequent and liberal use of moisturiser, including after the eczema appears to have cleared up. There are lots of moisturisers on the market. Trial and error is the best way to find the right moisturiser for your skin. Keep in mind that if you use a light one, you need to reapply it more often than a heavy one. While tablets can help stop the inflammation, in general that’s not enough to stop the eczema. 5) Use your topical corticosteroid creams as directed. Additives reduce the skin thinning that can occur with prolonged use of potent topical steroids. Your dermatologist is the best person to advise you on this. Researchers are investigating whether a new class of drugs, called biologics, could help manage severe eczema. Biologics try to block critical steps within certain pathways, which can terminate inflammation. Biologics are most commonly produced from bacteria or yeast cultures. Specific genes are inserted into bacteria and yeast that have been inactivated so they are no longer dangerous to humans. Production of biologics in this way is slow, low-volume, high-tech and expensive. Consequently, biologics can cost tens of thousands of dollars per patient per year. A number of clinical research trials are underway to test these agents. People with severe eczema, which is not adequately controlled with current treatments, may consider enrolling to participate in a research trial. It will still take three to five years for the results of these trials to be fully assessed and to know whether biologic agents are safe and effective in the management of eczema. If they are, they could revolutionise the management of severe eczema.